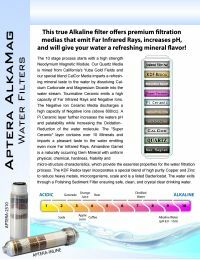 The APTERA-2510 is a true alkaline ionized water filter cartridge that uses premium medias that emit Far Infrared Rays, increases pH, lowers ORP, and gives your water a refreshing mineral flavor. 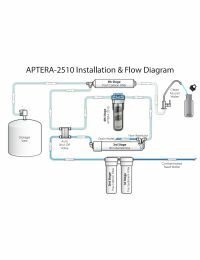 The Aperta-2510 is a 9-7/8" x 2-1/2" ionized alkaline water filter cartridge and is recommended for post RO (Reverse Osmosis) and includes 10 unique medias. It should be placed between the permeate side of the membrane and the RO holding tank (See Diagram). The Aptera alkaline ionized water filter requires a very slow flow rate of 0.025 gpm in order for the water to have sufficient contact time with each of the medias. What is Oxidation Reduction Potential? (also known as ORP or Redox Potential) is a measure of h2O's (water's) ability to gain or lose electrons in chemical reactions. Just as the transfer of hydrogen ions in water determines the pH level, the transfer of electrons in water determines the ORP value. Why should I be concerned with the ORP of my water? The ORP value of a water supply is directly related to the effect it has on plumbing and bacteria growth. The life expectancy of bacteria in water is more dependent on the ORP value than the chlorine concentration or pH value. For swimming pools with a pH value around 7.5, the ORP value must be kept above 700mV to kill harmful bacteria.